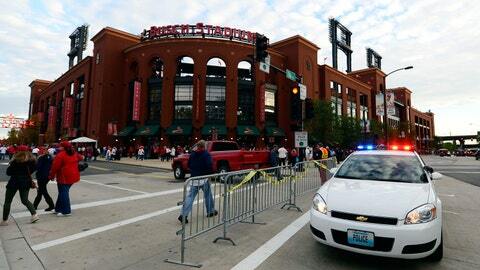 St. Louis Police Chief Sam Dotson says officers will be in greater numbers for the postseason. ST. LOUIS — Baseball fans converging on downtown St. Louis for the first-round playoffs series between the Cardinals and the Chicago Cubs can expect a greater police presence. St. Louis Police Chief Sam Dotson says officers will be in greater numbers for the best-of-five series that gets under way Friday. Game 2 is on Saturday. A local business promotion group, Downtown STL Inc., says it will provide guides who will be able to help direct fans to the city’s sites and assist them to their and from their vehicles, among other things. Such services aren’t uncommon for big events in downtown St. Louis. But it comes two weeks after an Army veteran was shot and potentially paralyzed during a robber as he walked with his girlfriend to their vehicle after a Cardinals game.